Digestive problems? Millions of Americans are suffering with poor digestive health these days brought on by not only poor dietary choices but poor dietary advice as well. The mainstream nutrition advice to eat low-fat, eat more whole grains and eat more fruits and vegetables can actually exacerbate many digestive problems. Yesterday I made another TV appearance here in western Massachusetts where I discussed five tips for better digestive health. Most of these tips are not tips your doctor is telling you about. But they’re really important, especially if you’ve been experiencing more chronic, long-term digestive problems. So did you watch it? Are those tips something different from what your doctor has told you? Or did you not watch it? I know, six minutes and forty-seven seconds to watch a video is an eternity in today’s digital age. Don’t worry, I’m not offended. I’ll list the five tips for better digestive health below with a very brief summary and if something peaks your interests, well,you might have to go back and watch the vid. I’m also going to include another video clip from my last appearance which is very applicable to tip number four. Tip #1 for Better Digestive Health: Relax and Chew. I know, that’s not exactly earth shattering information. But if you’re new to the world of “alternative” nutrition, these next two might peak your interest a little more. Tip #2 for Better Digestive Health: Go Grain-Free for At Least a Few Weeks. a. You’ll also be going gluten-free. Unless you live under a rock you’ve probably noticed a rising tide of gluten allergies and sensitivities in our culture. There are many reasons for this but the short and sweet explanation is simply that gluten can be hard to digest. b. You’ll also stop eating a lot of processed foods made from refined grains, sugar and chemicals. Sugar and refined grains form the foundation of most people’s diet and this is the root cause of so many digestive problems. You can still eat a lot of these even on a gluten-free diet. c. You’ll also stop eating improperly prepared grains. This is the problem with the well-intention but misguided advice to eat more whole grains. It’s not that all grains are bad for you, it’s that we’ve lost the knowledge for how to prepare them to make them digestible. Traditional preparations include soaking, sprouting and fermenting grains. Without these traditional methods, grains can be very hard on our digestive system. Contrary to popular belief, healthy fats which include butter, coconut oil and fats from pastured animals actually help restore digestive function. 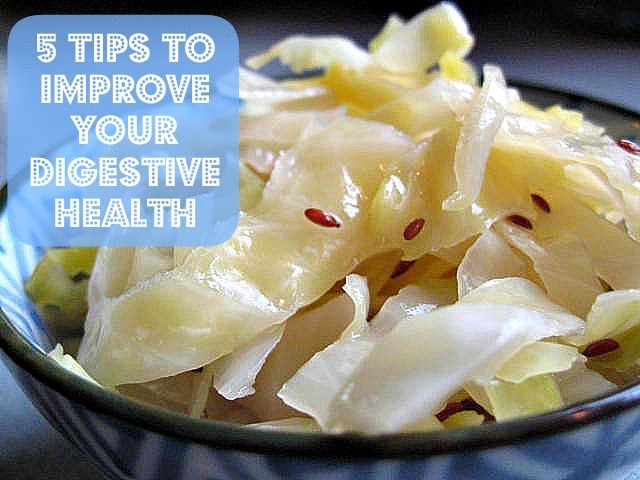 Fermented foods are pre-digested for you in the fermentation process. Fermented vegetables like sauerkraut, pickles and fermented dairy like yogurt, kefir and cheese are just a few common examples. Please throw the Campbell’s and Progresso soups away! Yes, I know they’re convenient. But please look at the label. It’s nothing but chemicals. Same for bouillon cubes and most canned and boxed stock as well. Homemade bone stocks may take a little extra time to make but they are chock full of beneficial nutrients that support digestive health such as minerals, amino acids and gelatin. My time was cut short on this tip so for a more detailed look at why homemade bone stocks are so important, click here for a previous post I wrote about it. 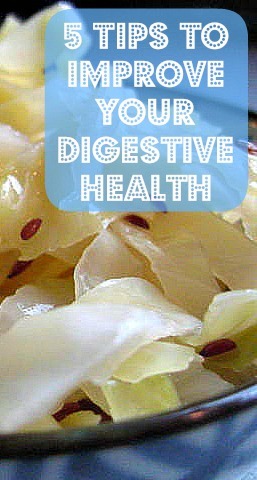 Of course, there’s a lot more to better digestive health than those five tips. They’re really just the tip of the iceberg. If you’ve been struggling with digestive issues for a while and need some extra help you can check out my 3-part video series for how to restore digestive wellness. This series will explore why poor digestive health happens, how to correct it with food and how to make it practical in everyday life. Click here to receive all three videos delivered to your inbox.